Originating from Scotland, the loyal Westie is well distinguished thanks to its teddy bear face and fluffy white coat. Bred to be what is called an 'Earthdog,' these super cute puppies were trained to chase vermin and dig them from their burrows. This charming tin sign however, features a 'hand drawn' illustration of the dog breed, as he stands facing from the side. Finished with a sweet little paw print, the lower section reads through some of the canines favourable traits: loyal, strong willed and loves to play! 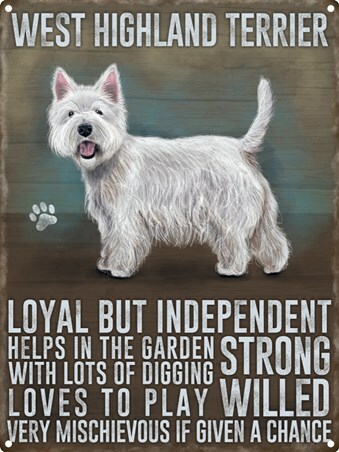 High quality, framed Loyal But Independant, West Highland Terrier tin sign with a bespoke frame by our custom framing service.